In 1837, Henry Irby purchased 203 acres in what is now the center of Buckhead for $650. He opened a tavern and grocery store at the northwest corner of Roswell Road and West Paces Ferry Road that became a stopping place for travelers in the sparsely populated wilderness. Before long, the community that grew around Irby’s store became known as Irbyville. At some point in the mid-1800s, the head of a large deer was put on a post not far from the tavern, and from then on, the area became known as Buckhead. By the early 20th century, Buckhead had become a posh suburb of Atlanta, where many of the city’s wealthiest people resided. The area was annexed into the city of Atlanta in 1952, and as early as the 1960’s, Fortune magazine described it as “the top encampment of business executives in the Southeast,” and that remains true today. Sometimes called “the Beverly Hills of the East,” Buckhead is home to one-of-a-kind estates, an abundance of trees, the Southeast’s finest shopping and restaurants, and some of the nation’s best private schools. 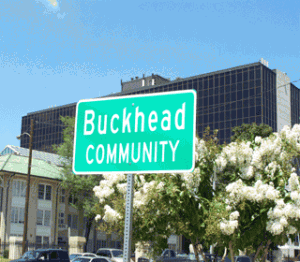 Some of the neighborhoods within Buckhead are Tuxedo Park, Garden Hills, Haynes Manor, Brookwood Hills, and Chastain Park. Cherokee Town and Country Club: The Cherokee Town and Country Club was chartered in 1956 with six hundred initial members. The Town Club is located in the historic Grant Estate on West Paces Ferry, and the Country Club is located near the Chattahoochee River in Sandy Springs. In 1997 Cherokee was called “the very best private country club.” The Town Club underwent a major expansion in 2008/2009, which added 25,000 square feet to the existing building. Piedmont Hospital: Piedmont Hospital is one of the oldest and most respected medical facilities in Atlanta. Created in 1905, Piedmont is home to world renowned physician and other specialists who are dedicated to making a positive impact on the health of not only their patients but also Atlanta residents through numerous community based services. Atlanta History Center: The Atlanta History Center was founded in 1926 to help preserve Atlanta’s rich history. It is located on over 33 acres in the middle of Buckhead and three of Atlanta’s most historic properties: Swan House, Tullie Smith Farm, and the Margaret Mitchell House. The Governor’s Mansion: The Governer’s Mansion was built in 1967 in the Greek Revival-Style designed by Thomas Bradbury. The home is over 24,000 square feet and boasts 30 Doric columns. There is an annual Easter Egg hunt, and the home is open for tours on Tuesday, Wednesday and Thursdays during the week. Chastain Park: At 268 acres, Chastain Park is the largest park in Atlanta. It offers a tennis center, North Fulton Golf Course, Olympic-sized pool, NYO Baseball Park, Chastain Park Arts and Craft Center, Stables and riding center and Chastain Park Ampatheater. Phipps Plaza: Phipps Plaza is an upscale shopping mall owned by Simon Property Group. It offers over 100 high-end stores such as Theory, Tory Burch, Saks Fifth Avenue, Jimmy Choo and Versace. It also has a full food court and 14-screen AMC movie theater. Lenox Square: Lenox is across the street from and the sister mall to Phipps Plaza. It was officially dedicated in 1959 and was the first major shopping mall in Georgia. More than 35 million people a year visit Lenox Square, many of them coming to see the Macy’s Christmas Tree, the 4th of July Fire works, or to ride the Pink Pig. Bennett Street Design District: Bennett Street began as a warehouse district, but in the mid-1970s art studios and galleries moved into the area. It is now a vibrant art scene that also offers antique shops and restaurants. Streets of Buckhead: The Streets of Buckhead is a $1.5 billion development found near the intersection of Peachtree Road and West Paces Ferry Road. Scheduled for completion in Fall 2011, this project will become the largest and most upscale shopping center in the Southern United States.